Dance started in River class on Tuesday afternoon. The children had attended an aerial dance performance by the MS Earth & Sky dance class on Monday. They were excited and inspired by what they had seen at the informal sharing. Dance begins with a story after lunch that relates to the theme of the day. We began with Dance by Bill T. Jones and emphasized the idea of "when I am dancing... I am thinking and I am feeling!" We moved quietly in our bare feet down to the multi and started warming up our bodies. 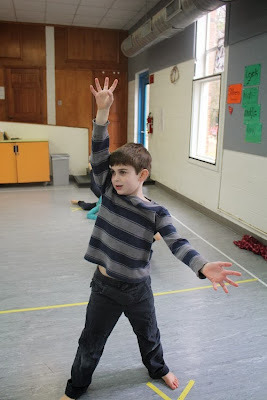 This week we danced to a poem that explored bending, twisting, jump-twirling and jump-punching. It was amazing to see how energized and imaginative the children were. Many children volunteered to show their own version of a zig-zag or circle floor pattern. We ended with a relaxation and dreaming about the classes to come!